Once contaminated sediment and soil is removed from the environment, it must be treated or processed for disposal in a landfill. With EPA approval, GE evaluated two treatment and three disposal approaches to address Housatonic River sediment and soil. The first treatment method under consideration in the Rest of River is chemical extraction. This involves mixing PCB-contaminated material with a fluid or solvent, resulting in separation of the PCBs from the sediment/soil. The contaminated fluid is then treated or disposed. This could reduce the volume of contaminated material that would need to be disposed of in a landfill. GE also analyzed a process called thermal desorption, where sediment/soil is heated to high temperatures, causing PCBs to evaporate from the material into a gas. The gas is then condensed, and the resulting liquid is treated or disposed. The most widely used technology for managing contaminated sediment and soil removed from the environment is placement of the material into a storage facility constructed in a waterway or on land. These facilities are typically designed to permanently contain the waste and prevent its release back into the environment. 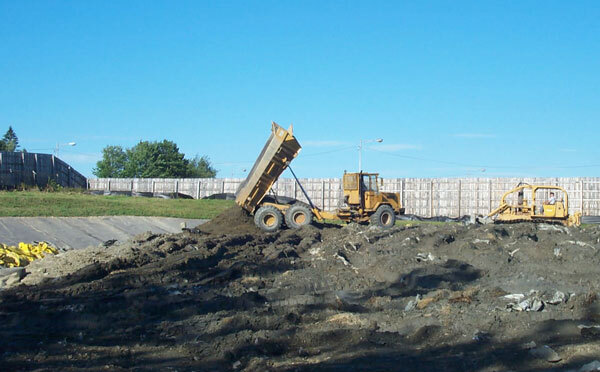 Storage in an Existing Landfill — Under consideration for the Housatonic is the transport of sediment and soil to an existing, licensed, off-site landfill, once the material is appropriately dewatered and processed for transport. Transportation to the disposal site could be by truck or rail. Based on the removal options being evaluated for the Rest of River, as much as 2.8 million cubic yards of material could need disposal in such a facility. Storage in a New Local Landfill — Another option approved by EPA for further evaluation is construction of a new hazardous waste landfill in close proximity to the Housatonic but outside the floodplain. The facility would have an impermeable liner/cover system, a leachate collection system to isolate PCBs from the environment, and a groundwater monitoring network. Storage in a Confined Disposal Facility — This type of facility is located in a waterway and is used to permanently isolate the contamination from the environment. Sediment is typically hydraulically pumped to a bermed area for dewatering. After removal of the sediment/soil is completed, the facility is closed with a vegetated soil cover.